The Canadian dollar is falling too far and too fast, damaging public and business confidence in Canada, say economists. National Bank Financial Markets warned in a new report Monday that the loonie is now out of line with fundamentals and the Bank of Canada cannot risk driving it even lower with a rate cut. Marion said that by his team’s calculations, the loonie should have shed about 10 cents against the U.S. dollar in the past few months. But it has fallen by 25 cents. …“Rarely has it tumbled so far so fast, and against so many currencies,” Marion said. “The steepness of the CAD’s depreciation against the USD is without precedent — 33%, or 3.5 standard deviations, in 24 months.”He warned that in order to help create some stability for the loonie, the Bank of Canada should not cut interest rates at its Wednesday meeting. Doing so would risk sending the currency as low as 66 cents this week. Economists aren’t the only ones warning about the damage of a lower loonie. Jayson Myers, chief executive of Canadian Manufacturers & Exporters, told Bloomberg Monday that exchange rate volatility has hurt business confidence and put a chill on spending decisions. Sorry guys, but this is all nonsense. There are absolutely no sign of “currency instability” (whatever that is) and there are no signs at all that the drop in the Canadian dollar is causing any financial distress. In fact if we look at the development in the Canadian dollar in recent weeks it has developed completely as we would have been expected given the drop in oil prices and given the developments in global currency markets in general. I have earlier argued that we could think of the Canadian free floating currency regime basically as a regime that shadows an Export Price Norm. Hence, the Loonie is developing as if it is pegged to a basket of oil prices (15%), the US dollar 65% and Asian currencies (yen and won, 20%). The graph below shows the actual development in USD/CAD and a “predicted” USD/CAD had Bank of Canada pegged the Loonie to 65-20-15 basket. The graph is pretty clear – there is nothing unusual about the development in the Loonie. Yes, the Loonie has weakened significantly, but this can fully be explained by the drop in oil prices and by the weakening of the Asian currencies (in the basket primarily the drop in the won) and of course by the general continued strengthening of the US dollar. If anything this is a sign that the Bank of Canada remains credible and that the markets are confident that the BoC will be able to ease monetary conditions further to offset any demand shock to the Canadian economy due to lower export prices (oil prices). Therefore, it is also obvious that the BoC should not undertake any action to curb the weakening of the Loonie. In fact if the BoC tried to curb the Loonie sell-off then the result would be a dramatic tightening of monetary conditions, which would surely push the Canadian economy into recession and likely also create public finance troubles and increase the risk of a financial crisis. Luckily the Bank of Canada for now seems to full well-understand that there is absolutely no point of intervening in the FX market to curb the Loonie sell-off. Well-done! I am writing this as I am flying to Moscow to spend a couple of days meeting clients in Moscow. It will be nice to be back. A lot of things are happing in Russia at the moment – especially politically. A new opposition has emerged to President Putin’s regime. However, even though politics always comes up when you are in Russia I do not plan to talk too much about the political situation. Everybody is doing that – so I will instead focus my presentations on monetary policy matters as I believe that monetary policy mistakes have been at the core of economic developments in Russia over the last couple of years. I hope to add some value as I believe that few local investors in Russia are aware of how crucial the monetary development is. 4) Changing the monetary regime: The Russian central bank (CBR) has said it wants to make the Russian ruble freely floating in 2013 (I doubt that will happen…). What could be the strategy for CBR to move in that direction? When talking about the Russian economy with investors I often find that they have a black-box view of the Russian economy. For most people the Russian economy seems very easy to understand – too easy I would argue. On the one hand the they see oil prices going up or down and on the other hand they see growth going up or down. And it is also correct that if one has a look at real or nominal GDP growth of the past decade then one would spot a pretty strong correlation to changes in oil prices. That makes most people think that when oil prices increase Russian exports increase and as result GDP increases. However, this is the common mistake when doing economics based on a simple quasi-Keynesian national accounting identity Y=C+I+X+G+NX. What most people believe is happening is that net exports (NX) increase when oil prices increase. As a result Y increases (everything else is just assumed to be a function of Y). However, a closer look at the Russian data will make you realise that this is not correct. In fact during the boom-years 2005-8 net exports was actually “contributing” negatively to GDP growth as import growth was outpacing export growth. So what did really happen? Well, we have to study the crucial link between oil prices, the ruble exchange rate and money supply. As I have described in an earlier post the Russian central bank (CBR) despite its stated goal of floating the ruble suffers from a distinct fear-of-floating. The CBR simply dislikes currency volatility. Therefore, when the ruble is strengthening the CBR would intervene in the FX market (printing ruble) to curb the strengthening. And it would also intervene (buying ruble) when the currency is weakening. In recent years it has been doing so by managing the ruble against a basket of euros (55%) and dollars (45%). 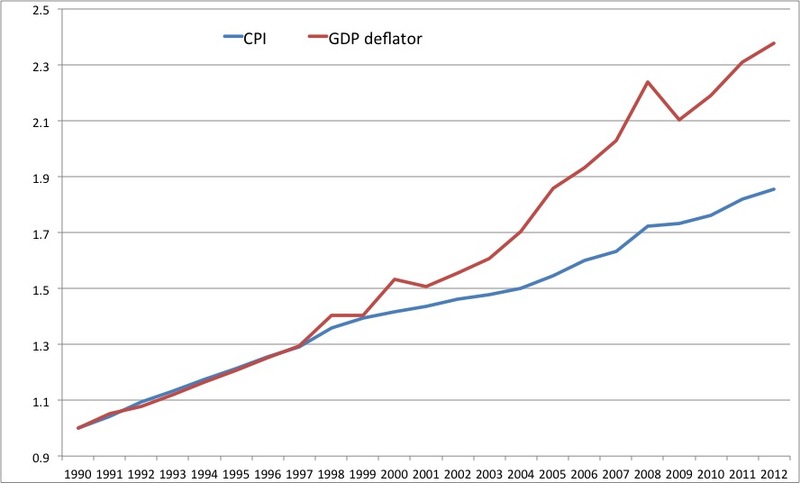 This is really the reason for the link between oil prices and the GDP (both real and nominal) growth. Imagine that oil prices increases strongly as was the case in the years just prior to crisis hit in 2008. In such that situation oil exports revenues will be increasing (even if oil output in Russian is stagnated). With oil revenues increasing the ruble would tend to strengthen. However, the CBR is keeping the ruble more or less stable against the EUR-USD basket and it therefore will have to sell ruble (increase the money supply) to avoid the ruble strengthening (“too much” for CBR’s liking). This is the petro-monetary link. Increased oil prices increase the money supply as a result of the CBR quasi-fixing of the ruble. p is of course inflation and y is real GDP growth. Equation 2,3 and 4 together is a very simple model of the Russian economy, but I frankly speaking think that is all you need to analyse the business cycle dynamics in the Russian economy given the present monetary policy set-up. (You could analyse the risk of bubbles in property market by introducing traded and non-trade goods, but lets look at that in another blog post). If we assume oil prices (oil) and trend-velocity (v’) are exogenous it is pretty easy to solve the model for m, p and y. So here we go – assuming sticky prices (the Phillips curve relationship between p and y) we get a relationship between real GDP growth and oil price changes similar to the “common man’s model” for the Russian economy. However, this link does only exist because of the conduct of monetary policy. The CBR is managing the float of the ruble, which creates the link between oil prices and real GDP growth. Had the CBR instead let the ruble float freely or linked the ruble in some way to oil prices then the oil price-gdp link would have broken down. You can easily use the model above to analyse what happen to the Russian economy in 2008-2009. I have already in a previous post demonstrated that the CBR caused the crisis in 2008-9 by not allowing the ruble to depreciate enough in the autumn of 2008. Lets have a short look at the crisis through the lens of the model above. What happened in 2008 was that oil prices plummeted. As a consequence the ruble started to weaken. The CBR however, did not want to allow that so it intervened in the FX market – buying ruble and selling foreign currency. That is basically equation (3). Oil prices (oil) dropped, which caused the Russian money supply (m) to drop 20 % in October-November 2008. As m drops it most follow from (2) that p and/or y will drop as well (remember we assume v’ to be constant). 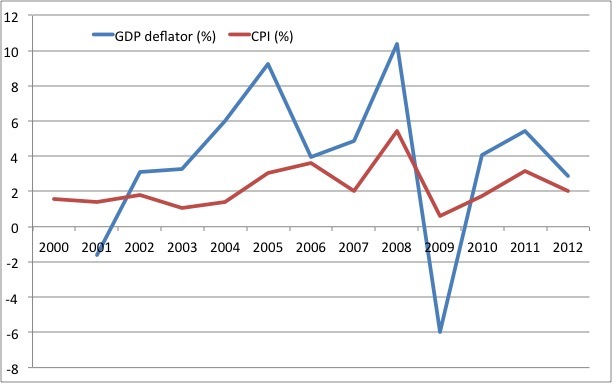 However, because p is sticky – that’s equation (4) – real GDP (y) will have to drop. And that is of course what happened. Russia saw the largest drop in real GDP (y) in G20. It’s really that simple…and everything that followed – for example a relatively large banking crisis – was caused by these factors. Had the ruble been allowed to drop then the banking crisis would likely have been much smaller in scale. On to the next step. In early 2009 the Federal Reserve acted by moving towards more aggressive monetary easing and that caused global oil prices to rebound. As a result the ruble started to recover. Once again that CBR did not allow the ruble to be determined by market forces. Instead the CBR moved to curb the strengthening of the ruble. We are now back to equation (3). With oil prices (oil) increasing money supply growth (m) finally started to accelerate in 2009-10. 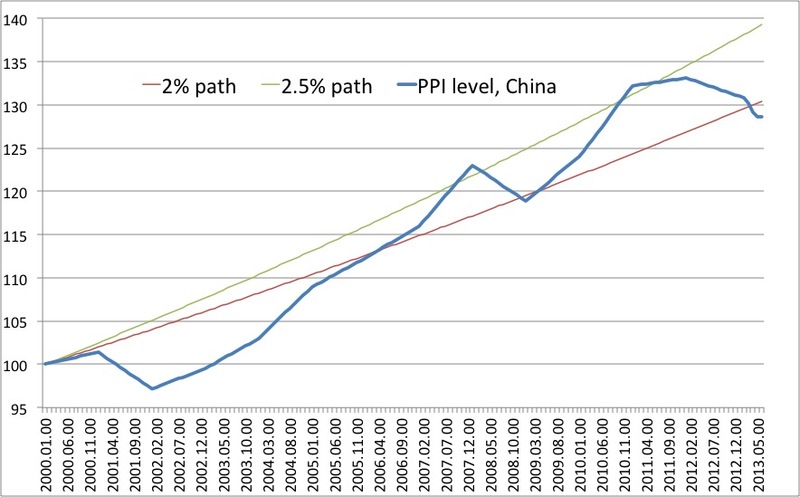 With m increasing p and y would have to increase – we know that from equation (2) – and as p is sticky most of the initial adjustment would happen through higher real GDP growth (y). That is exactly what happened and that process has continued more or less until today. It now seems like we have gone full cycle and that the Russian economy is operating close to full capacity and there are pretty clear signs that we now are moving back to an overly expansionary monetary policy. The question therefore is what is next for the CBR? The Russian central bank has announced that it wants to move to a freely floating ruble in 2013. That would make good sense as the discussion above in my view pretty clearly demonstrates that the CBR’s present monetary policy set-up has been extremely costly and lead to quite significant misallocation of economic resources. Furthermore, as I have demonstrated above the link between economic activity and oil prices only exist in the Russian economy do to the conduct of monetary policy in Russia. If the ruble was allowed to fluctuate more freely, then we would get a much more stable development in not only inflation and nominal GDP (which is fully determined by monetary factors), but also in real GDP. But how would you move from the one regime to the other. The simple solution would of course be to announce one day that from today the ruble is freely floating. That, however, would still beg the question what should the CBR then target and what instruments should it use to achieve this target? Obviously as a Market Monetarist I think that the CBR should move towards a monetary regime in which relative prices are not distorted. A NGDP level targeting regime would clearly achieve that. That said, I am very sceptical about the quality of national account data in Russia and it might therefore in praxis be rather hard to implement a strict NGDP level targeting regime (at least given the present data quality). Second, even though I as a Friedmanite am strongly inclined to be in favour floating exchange rates I also believe that using the FX rate as a monetary instrument would be most practical in Russia given it’s fairly underdeveloped financial markets and (over) regulated banking sector. Therefore, even though I certainly think a NGDP level target regime and floating exchange rates is a very good long-term objective for Russia I think it might make sense to move there gradually. The best way to do so would be for the CBR to announce a target level for NGDP, but implement this target by managing the ruble against a basket of euros and dollars (that is basically the present basket) and oil prices (measured in ruble). Even though the CBR now is targeting a EUR-USD basket it allows quite a bit of fluctuations around the basket. These fluctuations to a large extent are determined by fluctuations in oil prices. Therefore, we can say that the CBR effective already has included oil prices in the basket. In my view oil prices effectively are somewhere between 5 and 10% of the “basket”. I think that the CBR should make that policy official and at the same time it should announce that it would increase the oil prices share of the basket to 30% in 1-2 years time. That I believe would more or less give the same kind of volatility in the ruble we are presently seeing in the much more freely floating Norwegian krone. Furthermore, it would seriously reduce the link between swings in oil prices and in the economy. 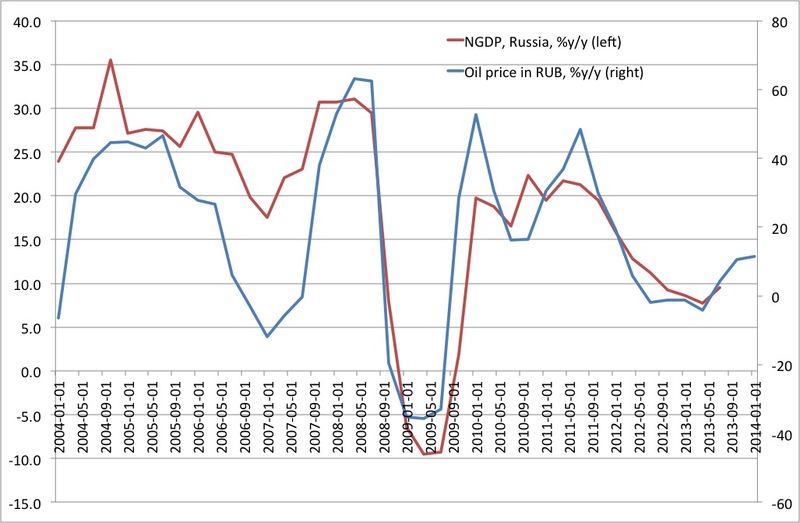 Hence, monetary policy’s impact on relative prices would be seriously reduced and as I have shown in my previous post there has been a close relationship between oil prices measured in ruble and nominal GDP growth. Hence, if the stability of oil prices measured in ruble is increased (which would happen if oil prices is included in the FX basket) then nominal GDP will also become much more stable. It will not be perfect, but I believe it would be a significant step in the direction of serious increasing nominal stability in Russia.